I don't even really know what "the dog days of summer" means. I think it's the end of summer when it gets really hot? That's what is going on in Oklahoma right now. We had a wonderfully mild summer and then bam, school started and it's 97 degrees everyday. I work in an air conditioned building so you know, I'm not sweating my eyeballs out or anything, but it's just so weird to think about fall-y things. In fact, I might go so far as to say that I am a little disturbed Starbucks is releasing the pumpkin spice latte early this year. Too far? In clothing news, this green skirt has continued to be the love of my life. 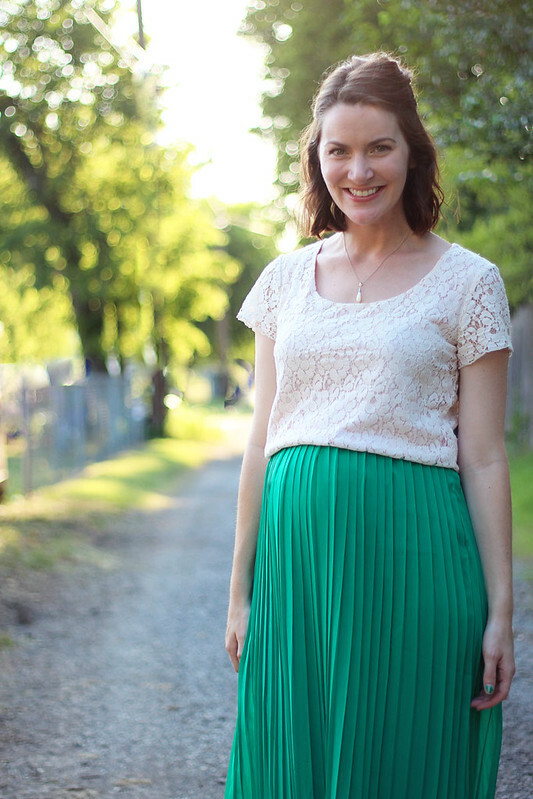 Any skirt that fits over the bump is a winner, and let's just say there are few winners left these days. I've had a few people ask me about this skirt so I wanted to let you know that it is on super-sale in black with free shipping (I caved and bought it myself!). I have a medium, if anyone was wondering about sizing. Haha, actually that is not helpful. If you want to see the skirt pre-20+ pounds of weight gain (if only I was exaggerating!) check out this post. its so weird, we didnt have a great summer and now all of a sudden its over 90 every day this week. i'm inside too, wish i was outside enjoying the summer, womp womp. that top is super cute! Beautiful outfit, love the pleats. I love your cream lace shirt paired with that bright emerald green. 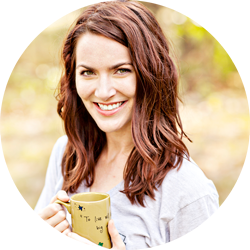 (You and your greens! lol) Also I would really like to thank you for not making every single outfit photo about your baby bump ie. not cupping it in every single shot. The one you put up is tasteful and cute. I don't know why I have such a pet peeve about excessive belly cupping..? Anyway you're doing such a great job of staying true to your style and blog without being over the top about pregnancy posts, so thank you for that!! We have had a fairly mild summer too. Of course now it is in the high 90s. Lovely. 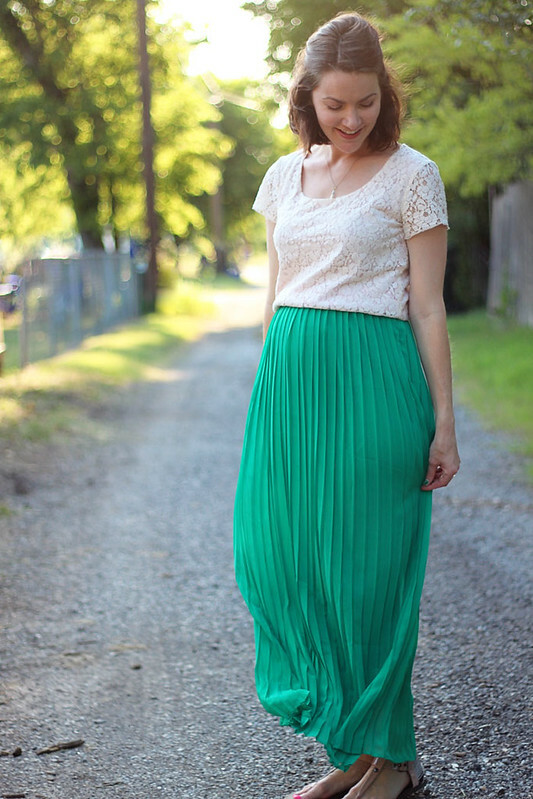 Love this green skirt! Looks fabulous! It's gotten totally hot here, too! This outfit is fabulous! Aw, I just love this skirt! I would totally buy it if there was still a green version! Same weather story here. We had such a nice July and then the last week has been so humid and hot. I'm not at all ready for fall, so I'm trying not to complain too much. I think back to my early elementary days when our building wasn't air conditioned and I don't know how we survived! That skirt is gorgeous - I want it. Your color is superb, though the lavender is pretty also. It looks great with the lace top, also. Loving your bump. You glow - simply put!! Enjoy the last dog days of Summer, Ash!! I feel like maxi dresses are such great pieces during pregnancy. I love how elegant this one is as opposed to a plain knit. The green is beautiful! I love this skirt every time you wear it. The color is so great. The weather was beautiful here last week. Very pleasant and not humid at all and now we are back to crazy almost 100 degree weather. Boo! I can't complain too much since I hate winter though. Yes! All the sudden our weather is in the 80s and SO humid when it's been in the 70s almost all summer! Hopefully it cools off before I start in my non AC room next week! I love this skirt on you no matter how you wear it! Your adorable bump is totally making up for you hiding it for so long. It totally steals the show! And this outfit is perfect. Your baby bump is so sweet - love how the skirt accents it. I wish I was as fashionable when I was pregnant! You look so adorable! 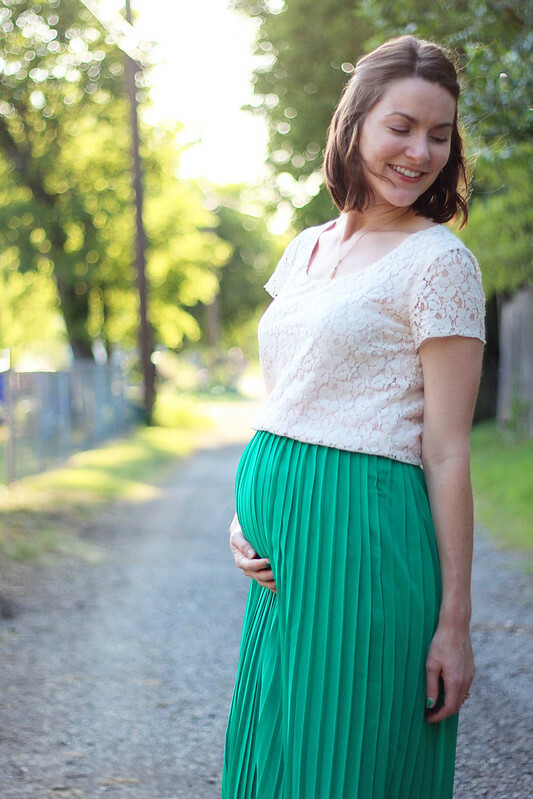 That skirt suits you and your bump so well! 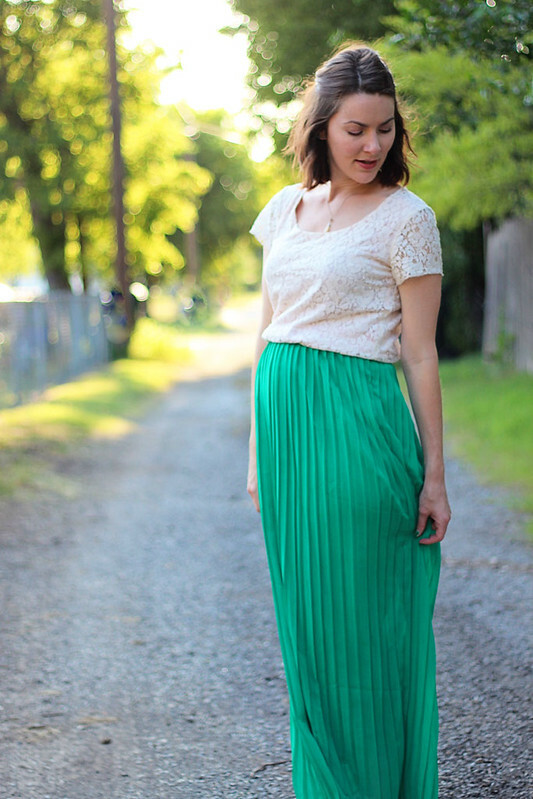 I have been looking for a maxi skirt and when you mentioned this one on clearance with free shipping, I jumped on it! I wish the purple was available, but they only have black now. Thanks for the great find! I remember you wearing this gorgeous skirt! It's perfect to accent your bump! That skirt is just beautiful and I love it with the lace. That's what I always thought of the "dog days of summer" as. And boy is it hot this week. I'd love to just make a collective "pass" on this weather. This is so cute! I never thought to try shirt/top proportions like this when I was pregnant, but I love how it works on you. And a long pleated skirt is just so glamorous.